Effective altruism is built upon the simple but profound idea that living a fully ethical life involves doing the “most good you can do.” Such a life requires an unsentimental view of charitable giving: to be a worthy recipient of our support, an organization must be able to demonstrate that it will do more good with our money or our time than other options open to us. In this talk, Singer will introduce us to an array of remarkable people who are restructuring their lives in accordance with these ideas, and show how effective altruism challenges common views about the choice between different good causes. 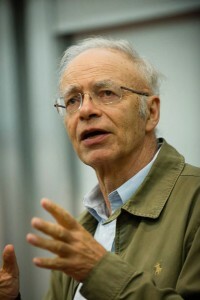 Peter Singer is an Ira W. DeCamp Professor of Bioethics in the University Center for Human Values at Princeton University. From 2005 on, he has also held the part-time position of Laureate Professor at the University of Melbourne, first in the Centre for Applied Philosophy and Public Ethics, and then in the School of Historical and Philosophical Studies. Peter Singer was the founding President of the International Association of Bioethics, and with Helga Kuhse, founding co-editor of the journal Bioethics. Outside academic life, he is the co-founder, and President, of The Great Ape Project, an international effort to obtain basic rights for chimpanzees, gorillas and orangutans. He is also President of Animal Rights International. Read more about Peter Singer.